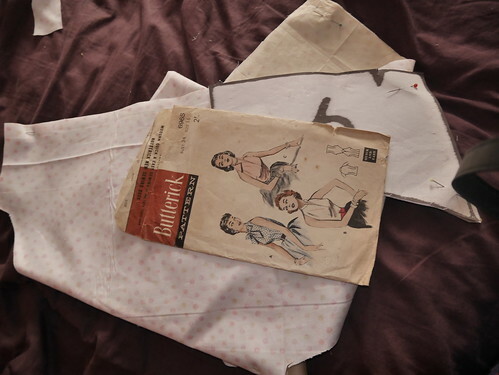 It is surprising what experience will do for you. 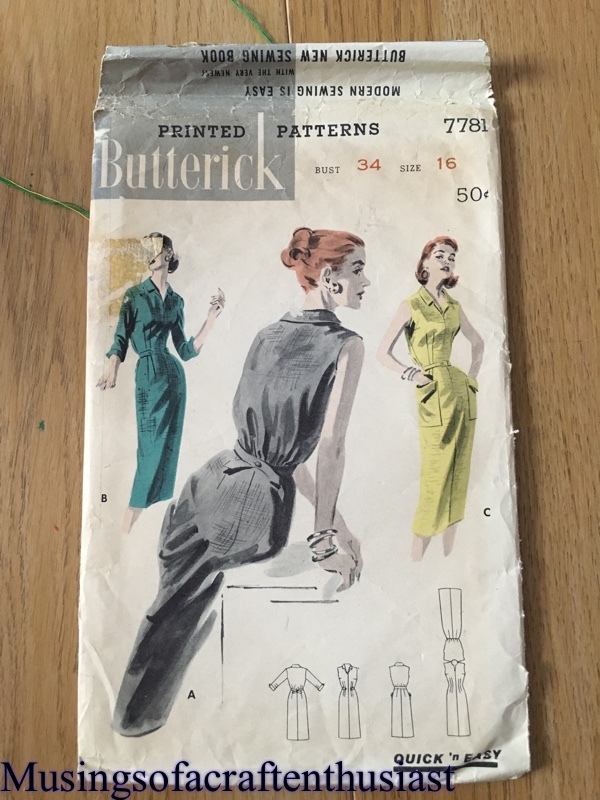 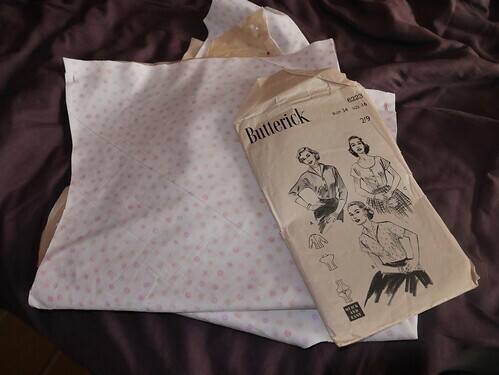 One of the first patterns I bought was this one Butterick 7781, the first time I made it was a disaster, the test fabric which was a seersucker probably didn’t help, it was exactly my measurements so I did no alterations, this was the result. 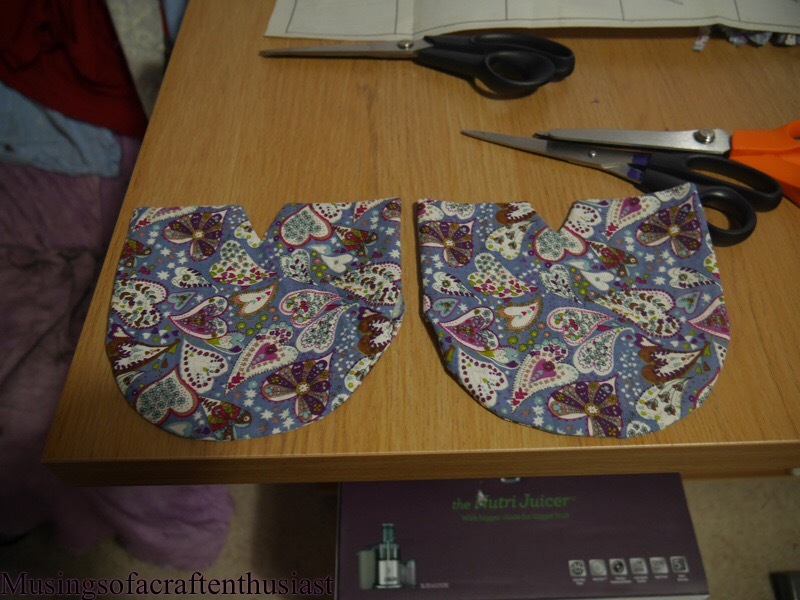 At this point I screwed it up in a ball and left it in a drawer. 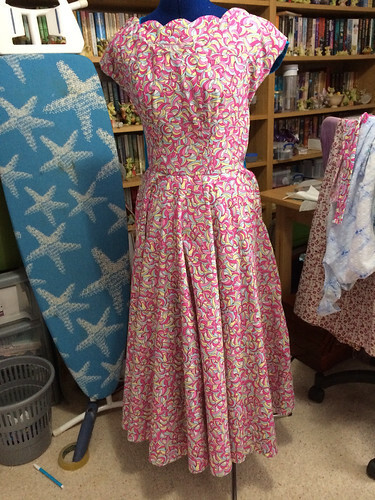 Fast forward 30 months and i decided to have a second attempt, I made a couple of changes one of which was to shorten the bodice 1 inch and the skirt 2 inches as per my proportional dress pattern. 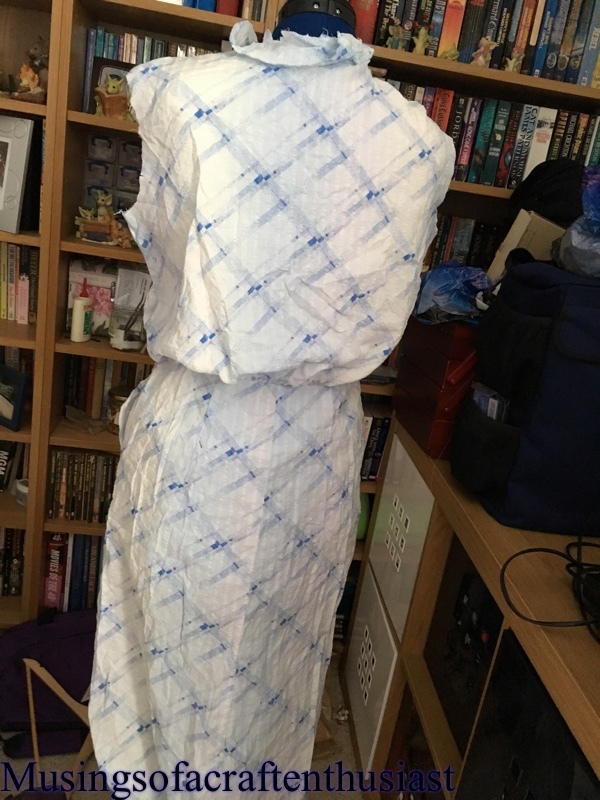 What I didn’t do was a 1/2 in small bust adjustment, I still haven’t worked out how to do this satisfactorily for a full length front piece. 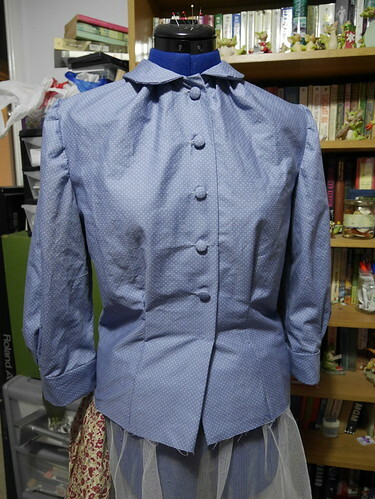 This is what the new version looks like so far. 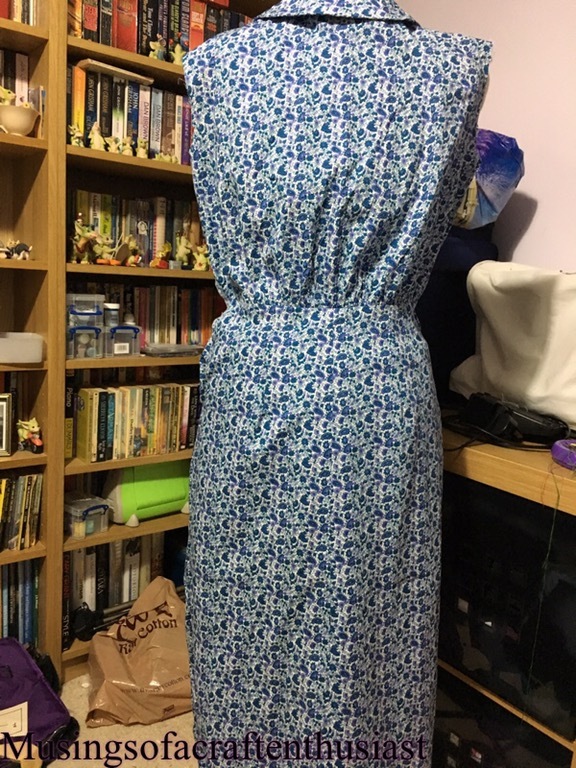 If we get any sun while I’m not at work, I’ll try and take some pictures outside, I also have two more dresses basically finished, one you have already finished and one other. 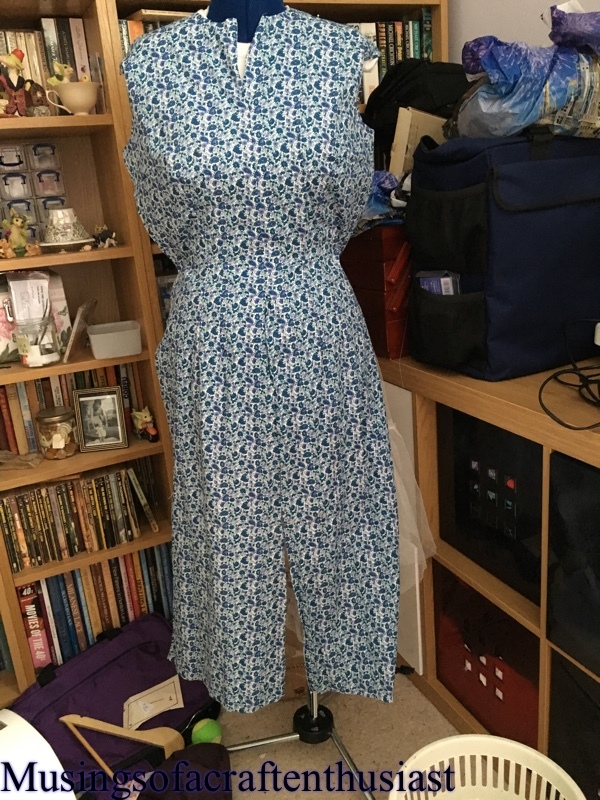 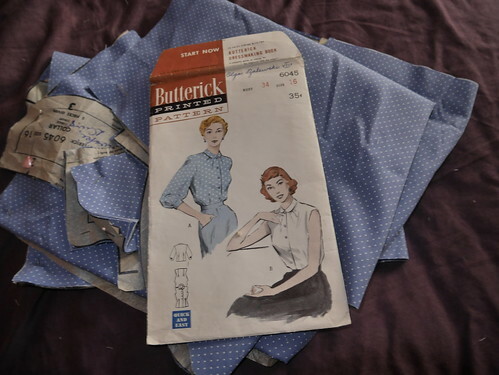 I’ve put the blue blouse together and it is hideous, it doesn’t look too bad on the Dress Form though it still doesn’t look much like the picture on the packet. 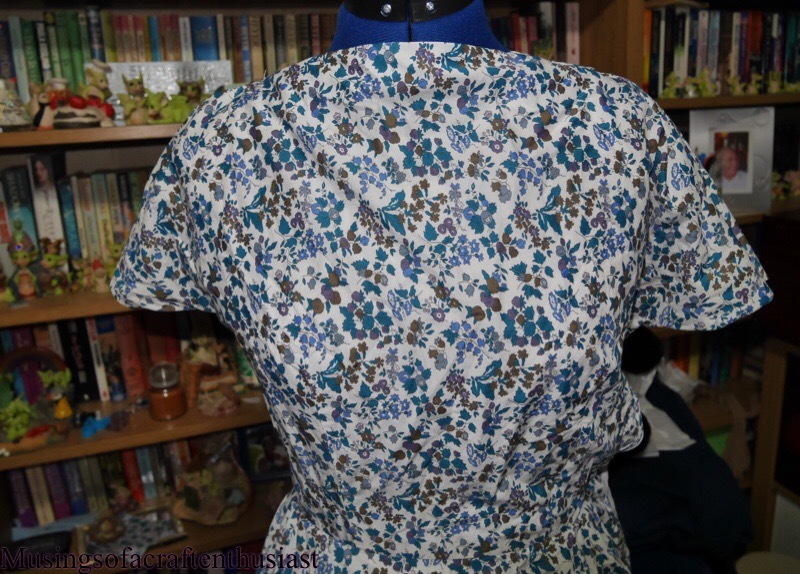 I really have to stay away from patterns that have extra fabric at the neck/bust line, I just don’t have the bustage for them. 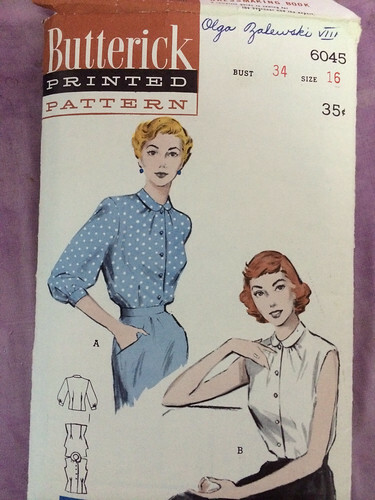 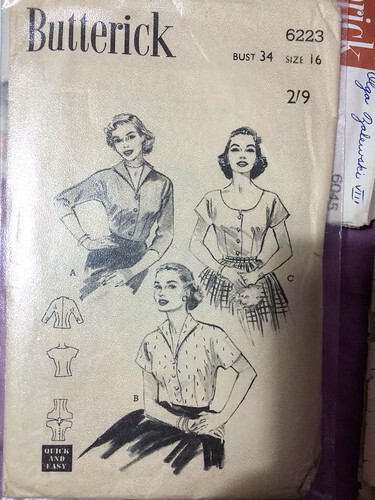 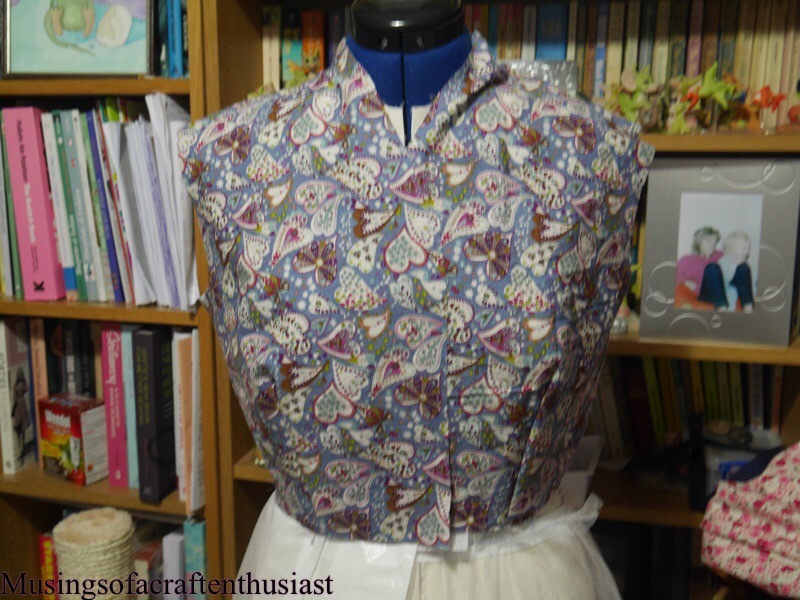 Not only does this Blouse have the gathers at the neck line which means that the small collar doesn’t lay flat and there is a lot of fabric over the bust, it has open darts/pleats at the waist line which makes it very puffy, creating an excess of fabric under the bust. 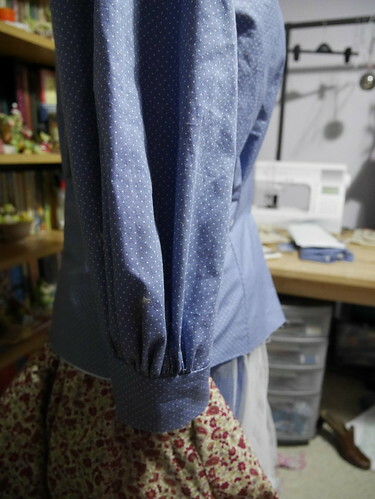 There is a lot of fabric in the sleeves but I can live with them, and in fact they are probably the best thing about the Blouse. 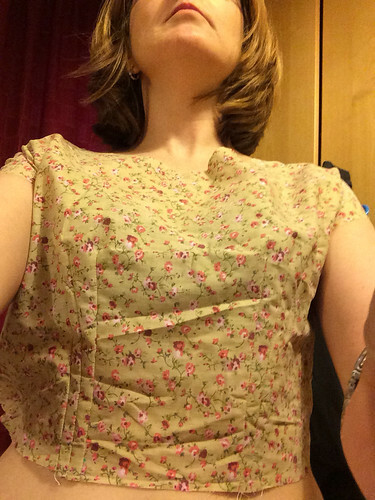 In short it makes me look very blob like. 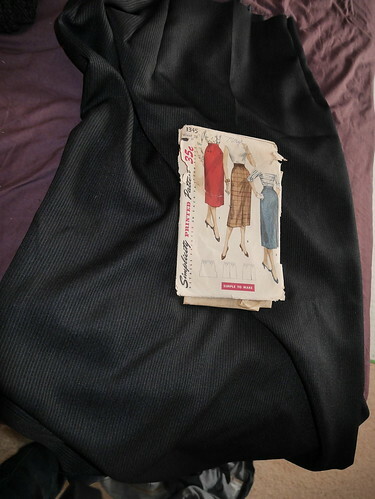 To top it all I’m not sure that I like the colour very much. 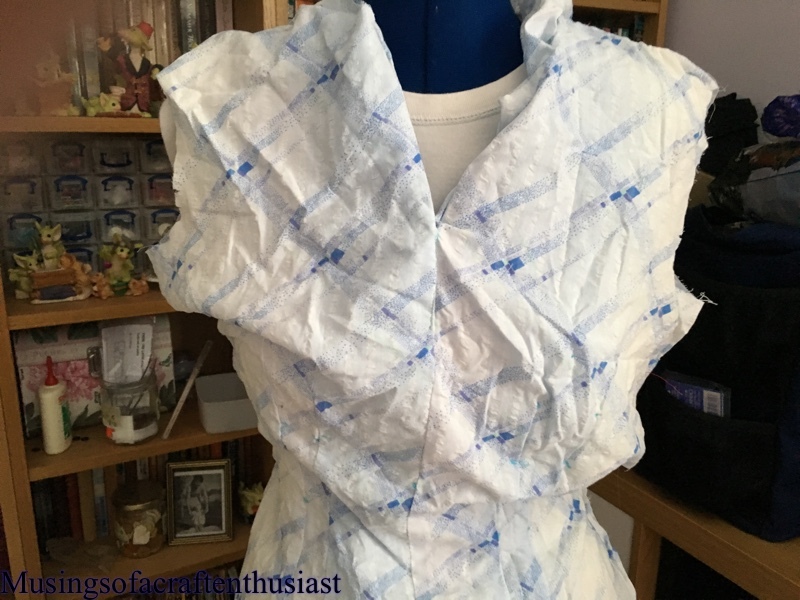 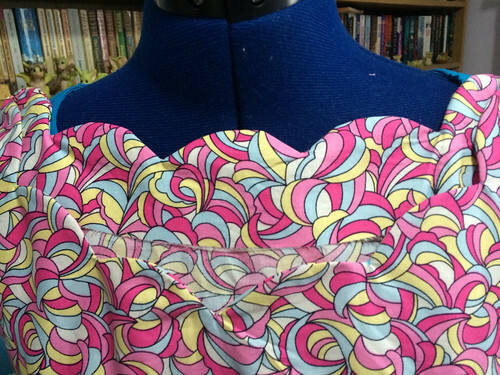 I’m hoping that if I close the darts and change the neck line that it will be wearable, so watch this space, I have enough fabric so I could recut the front or the back but not both. 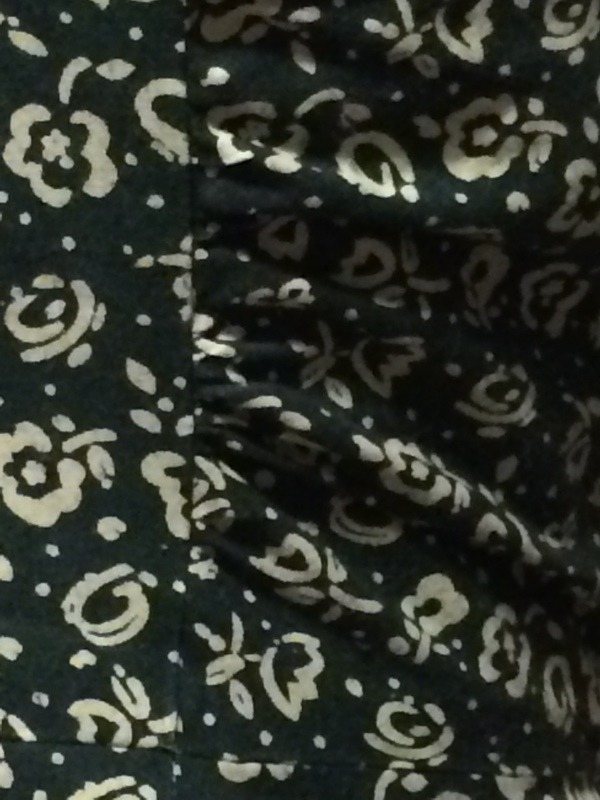 this is the second time i have written this post the first time i posted it, i received txt congratulating me on my post then it disappeared into the posting black hole. 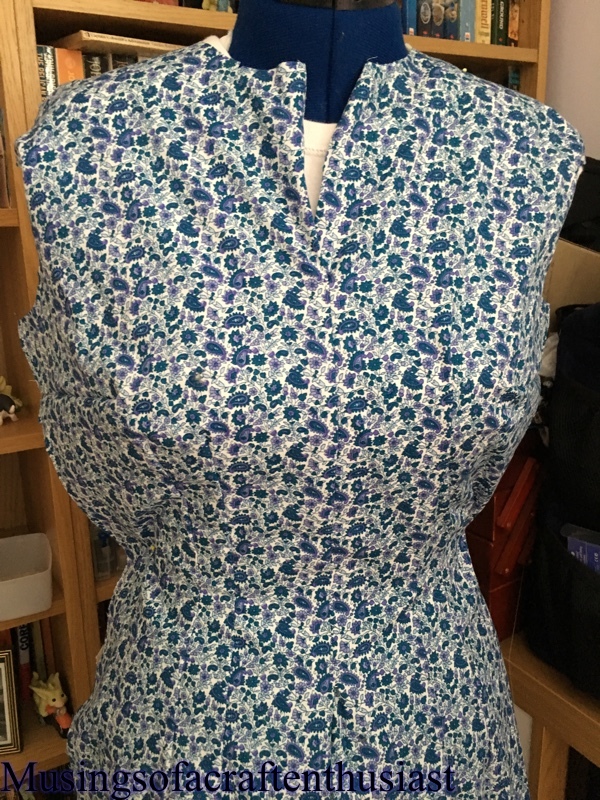 I was a bit concerned about the scalloped neckline as the pattern was a size too large, although i knew i could slash the pattern the scallops would be a challenge. 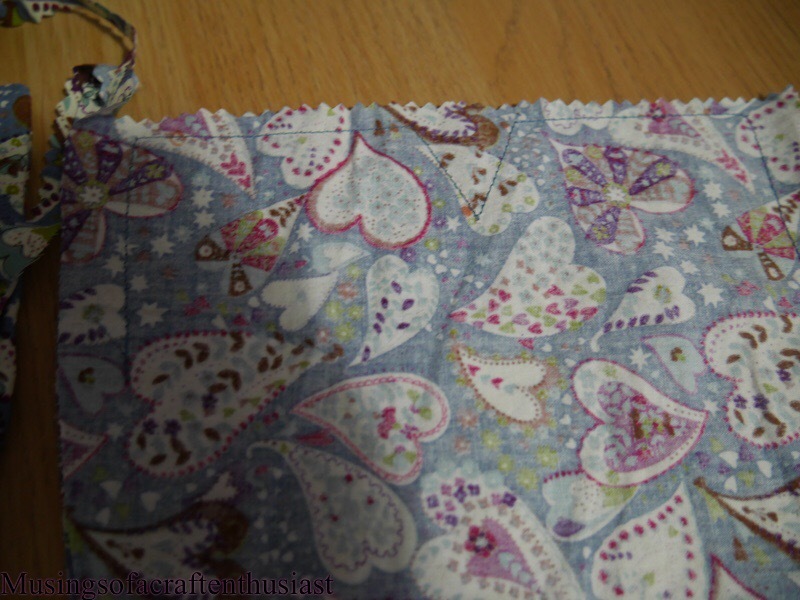 I decided to use my printer scanner, i worked out the ratio i needed to reduce it by, and hey presto. 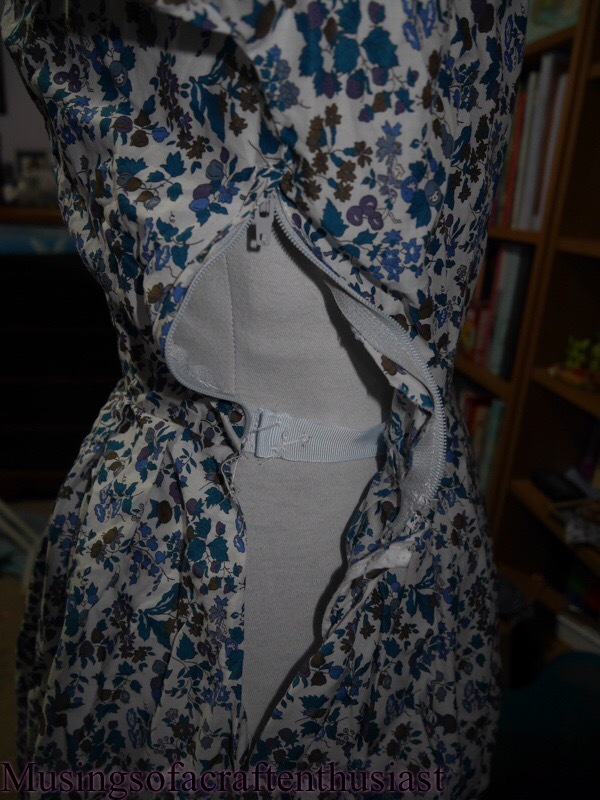 the only change i made between this top and the one the actual dress is that i lengthened it by 1/2 inch. 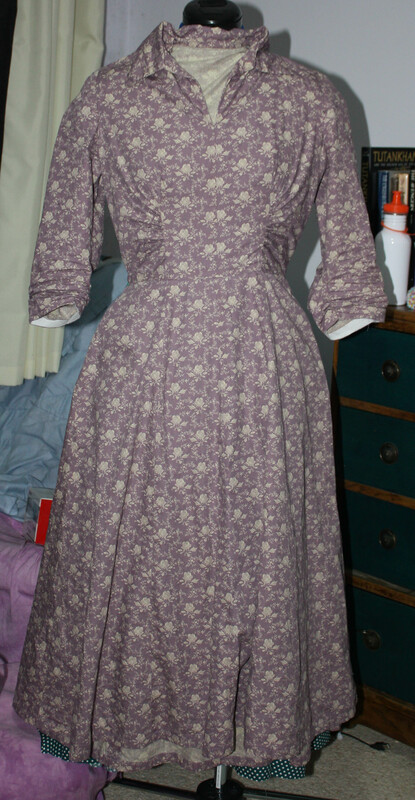 I’m going to try to do a slightly more in depth post on this dress. 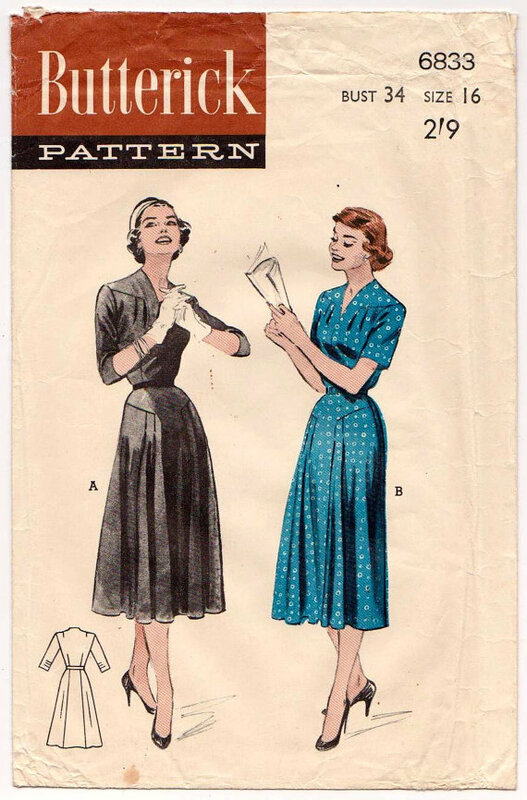 If you look closely at the pattern you should just be able to make out the pattern detail on the shoulders and hip. 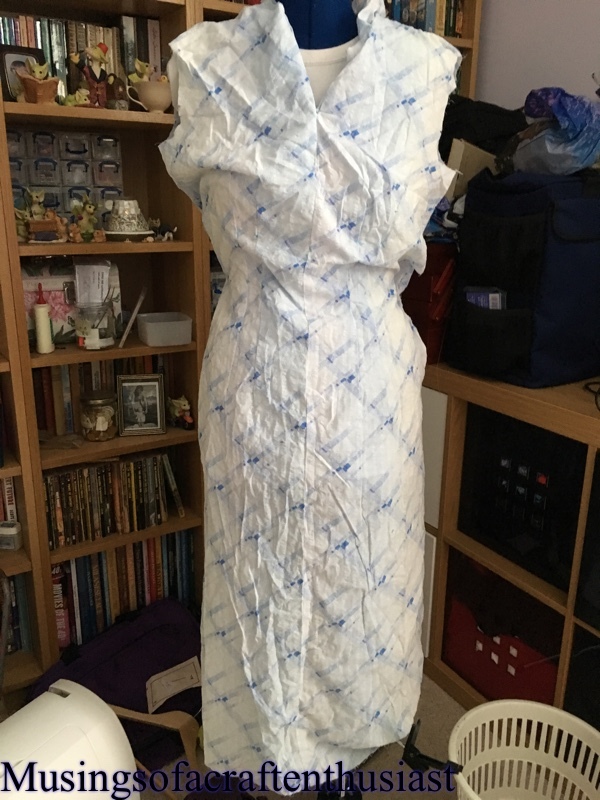 I thought that the print might have been a bit mistake but from a distance it isn’t too bad. 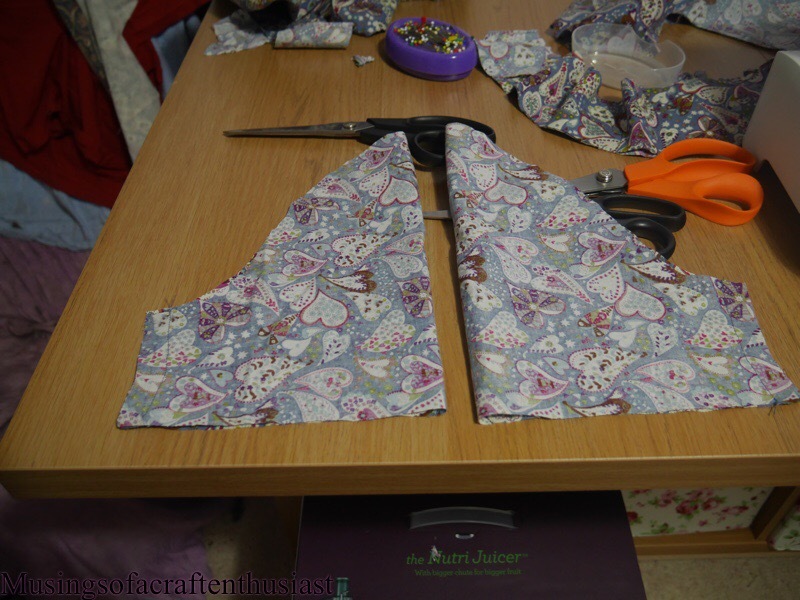 It is just as well it is so busy as I folded the fabric in half which meant that some of the pattern ended up upside down. 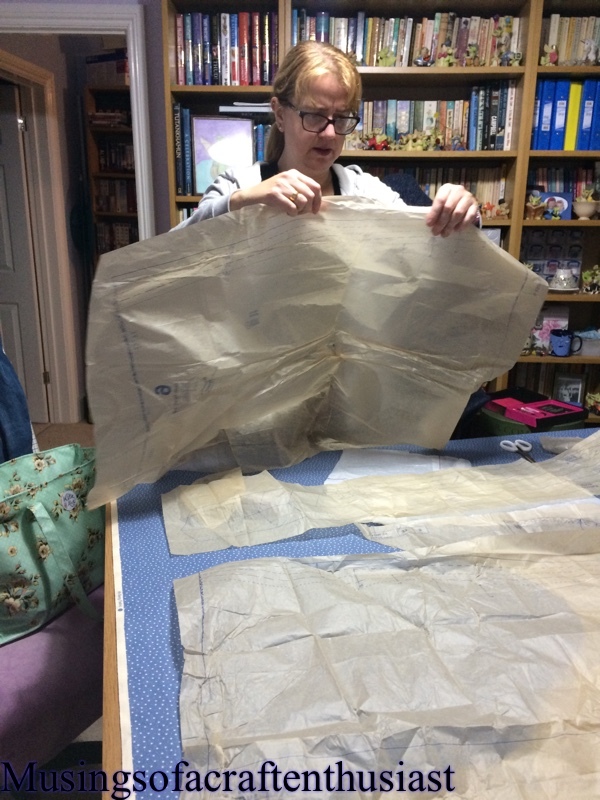 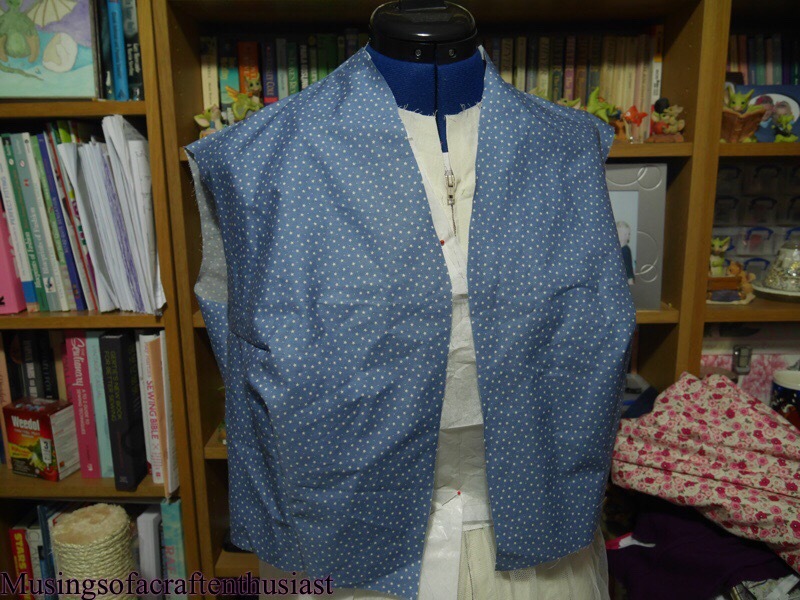 The first photo is the front pieces, you need to enforce the front with two sets of stitching round what will become the slash point which you can’t see on this photo, but what you can see is the placket which is used to reinforce what will become a seam. 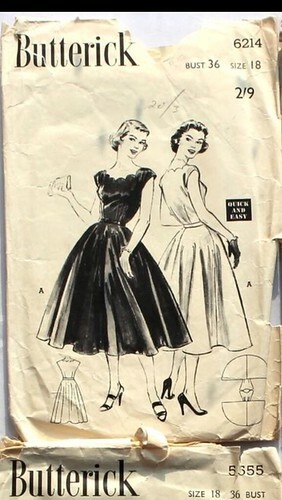 You then slash up to the dot. 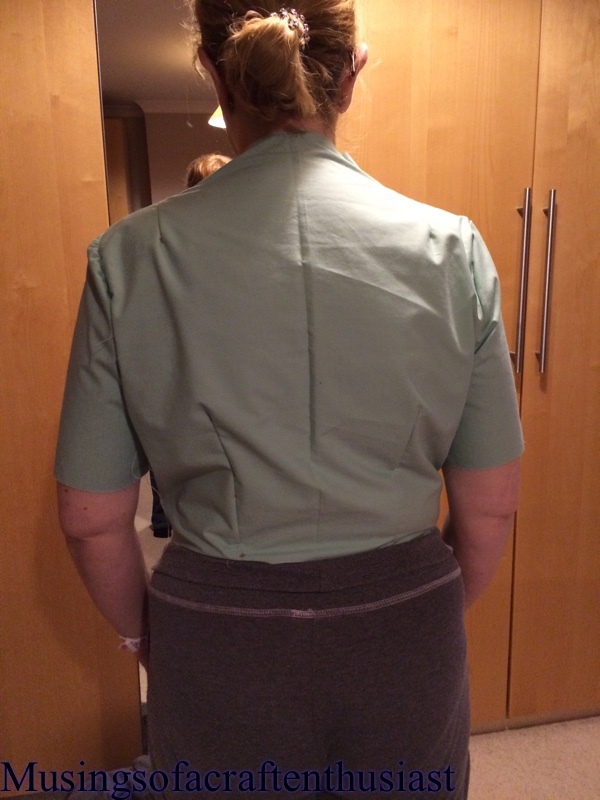 stitch the placket over the top of the pleats using topstitching, unfortunately the top stitching hasn’t come out well in this photo. 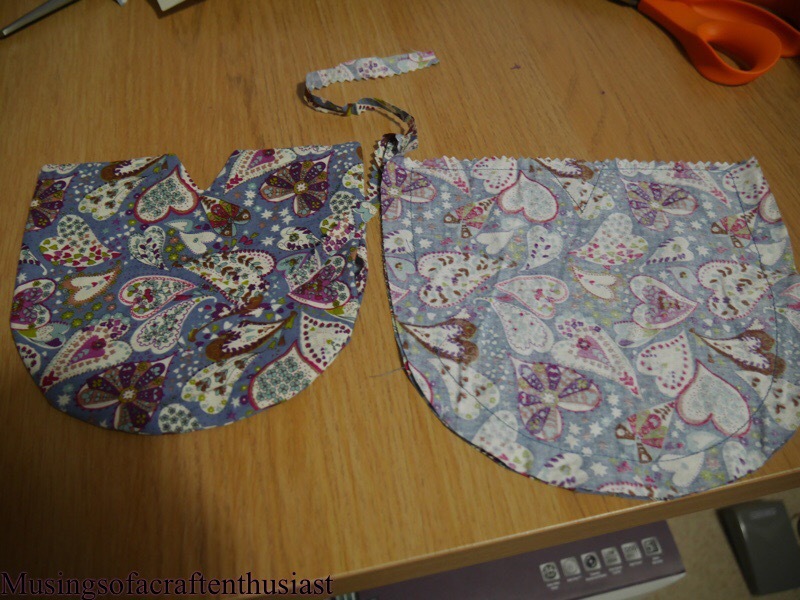 roughly the same process is copied for the front of the skirt. 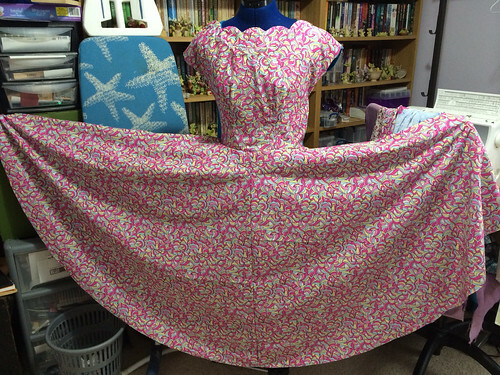 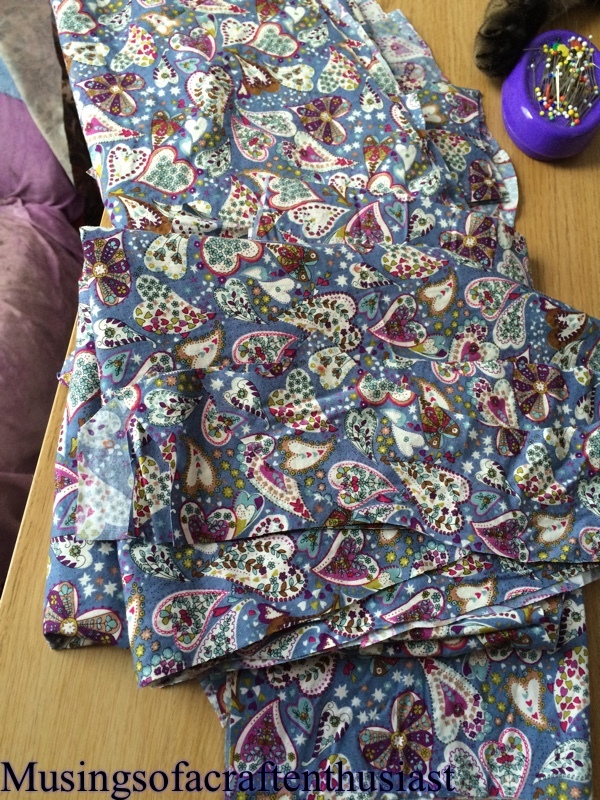 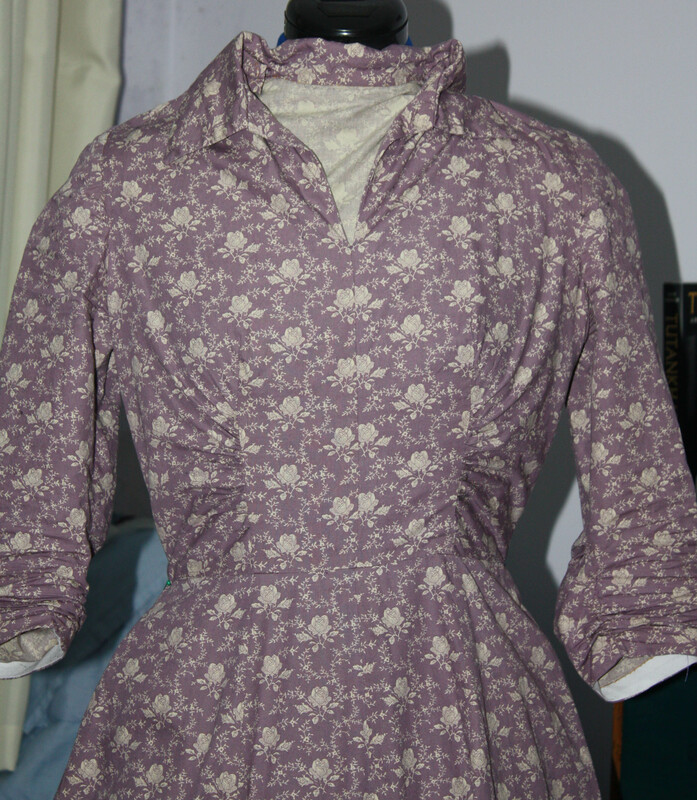 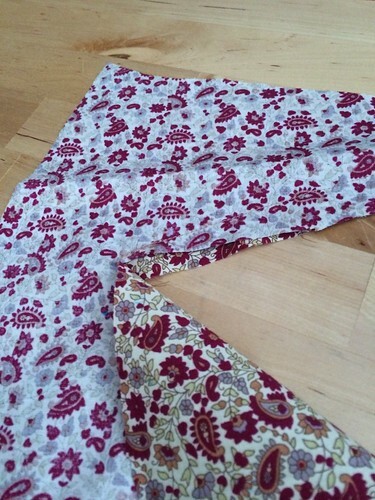 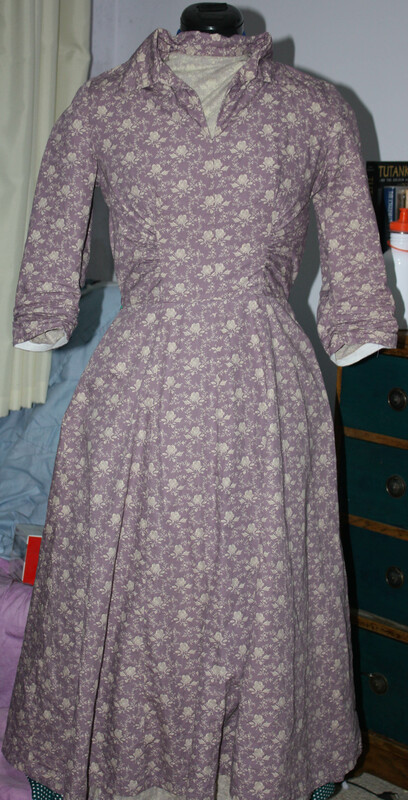 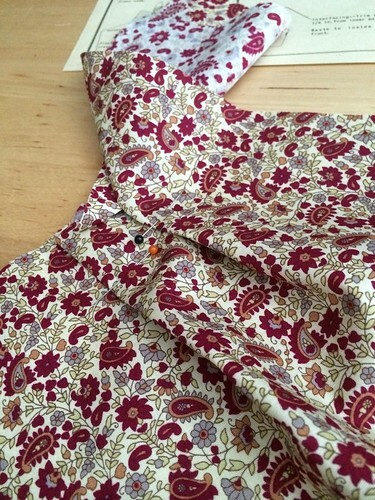 First we have mauve dress, I’ve used this fabric a couple of times in different colourways. 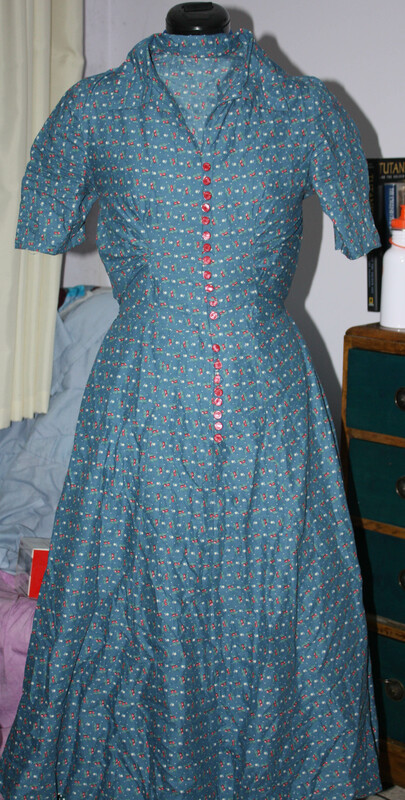 I love this dress, it is the third pattern I actually finished, however you can see by the front I wimped out. 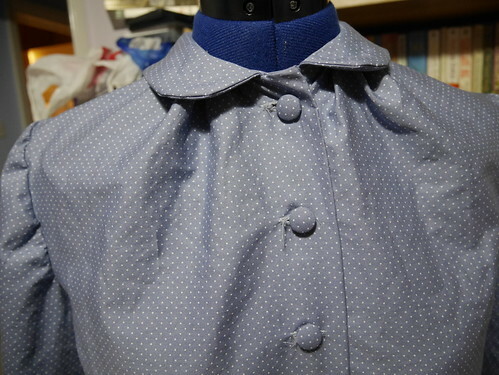 It should have 20 buttons and the corresponding button loops, it hasn’t it has a side zip instead. 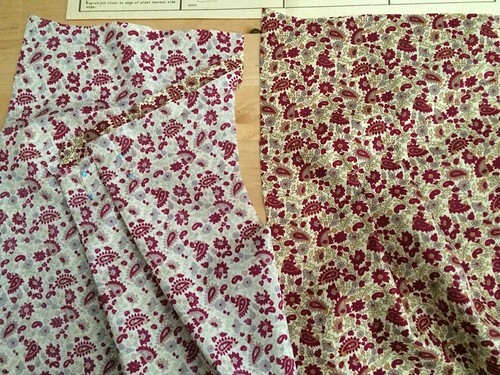 I discussed it with Ann we couldn’t decide what size buttons to use, we knew what they should look like, but not what they were called. 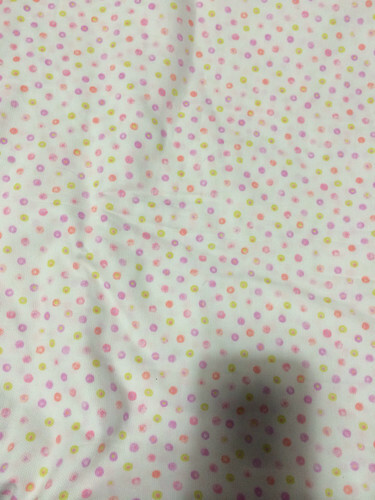 We thought it should have those little pearl/mushroom type buttons but not where to get them from and as I said not the size also have you any idea how hard it is to match buttons to this fabric. 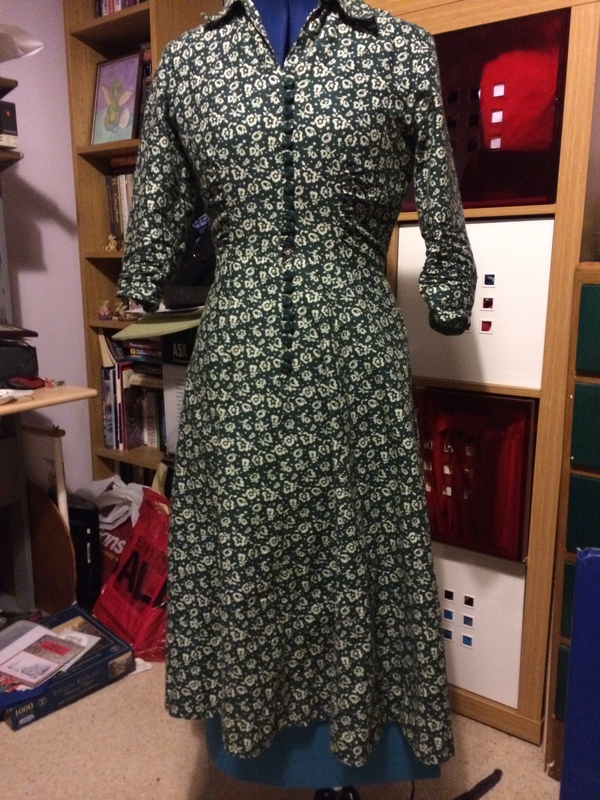 I liked this dress so much that I decided to make it again, this time with the button loops. 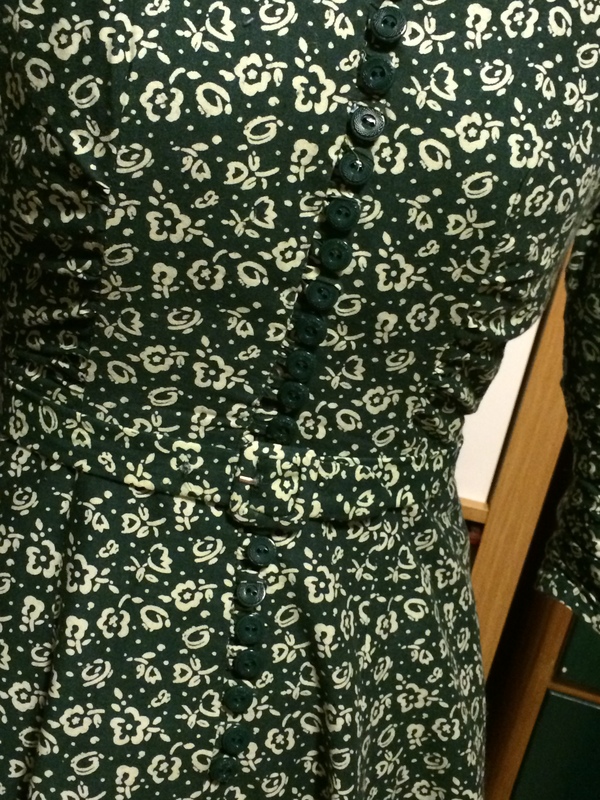 The Green Dress I found the buttons first, in a shop called Gina’s along the London Road, Gina has loads of buttons in boxes various prices and these small dark green buttons caught my eye I think they were 5p each bargain it took me about 5 minutes to find 21 of them (I like to get a spare). 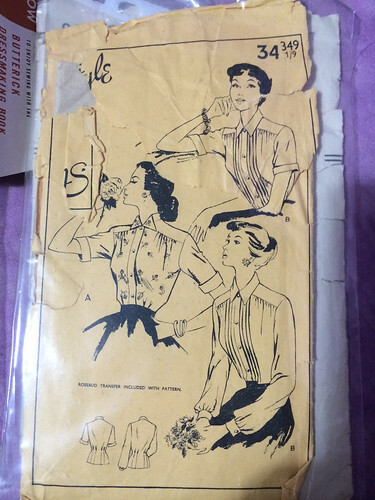 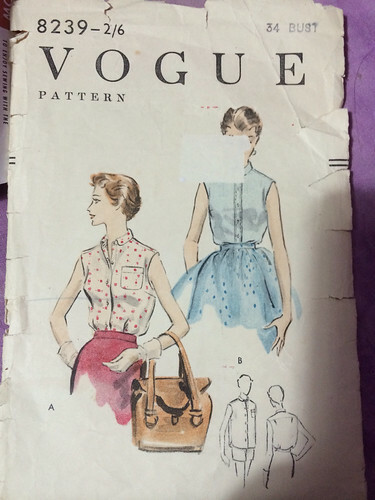 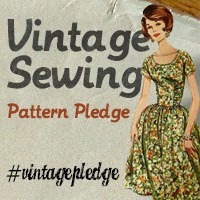 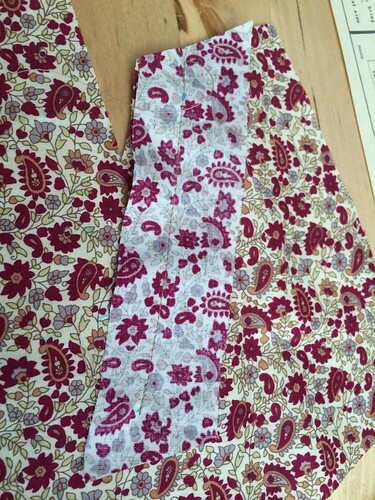 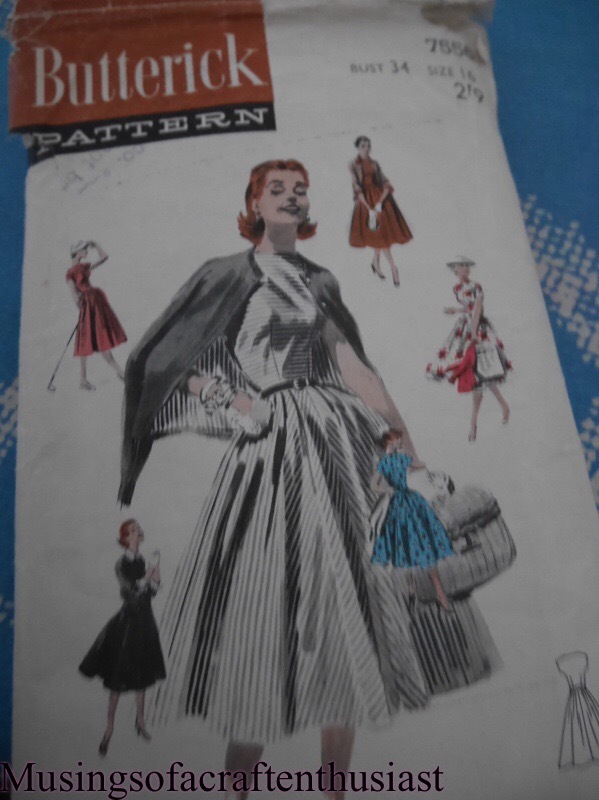 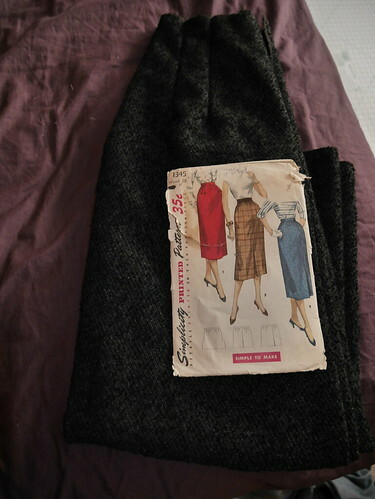 I when home straight on to eBay and found the fabric Cotton vintage type pattern very reasonable. 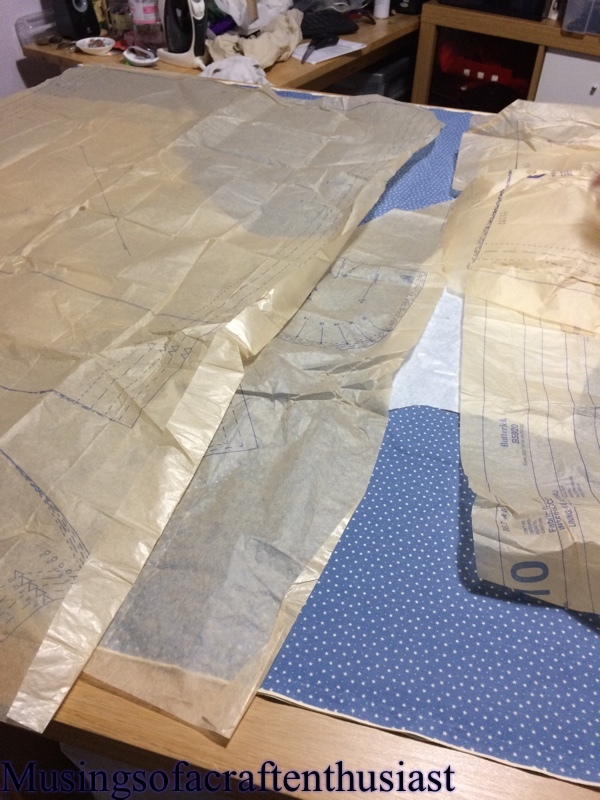 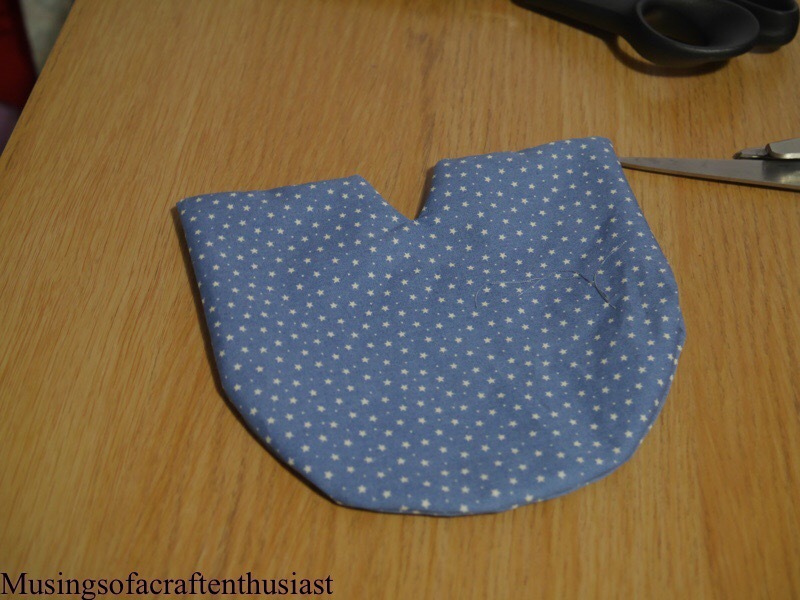 If you follow the instructions it goes together very easily, it is slightly too big up the sides but you can fix that by taking in the side seams 1/4 inch. 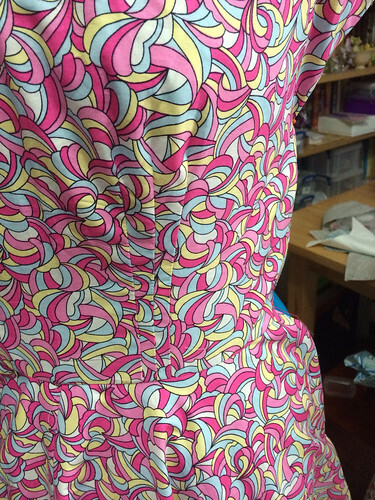 The button loops were a nightmare it took me ages to get them turned in the right way, then working out how long to make them and the best way to attach them to the dress so they were equal distance apart before putting on the facing. 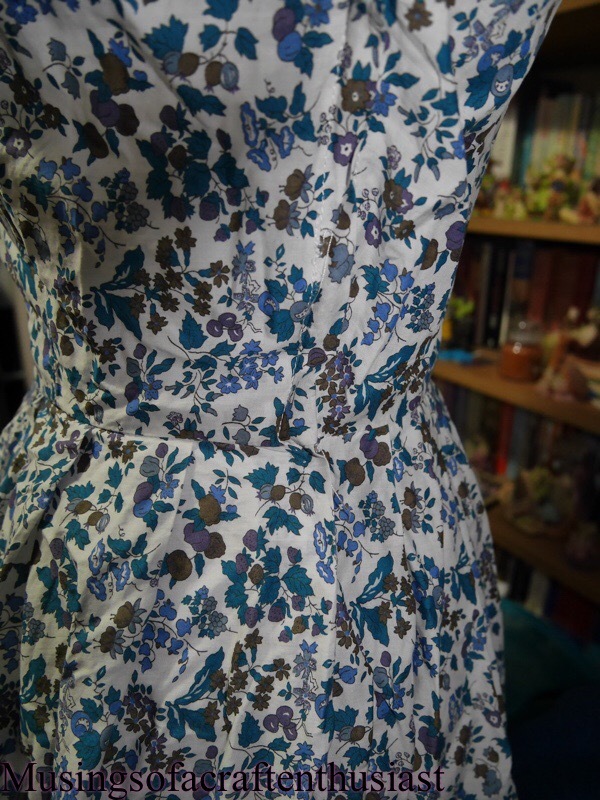 it was worth it, I think this is one of my favourite dresses. 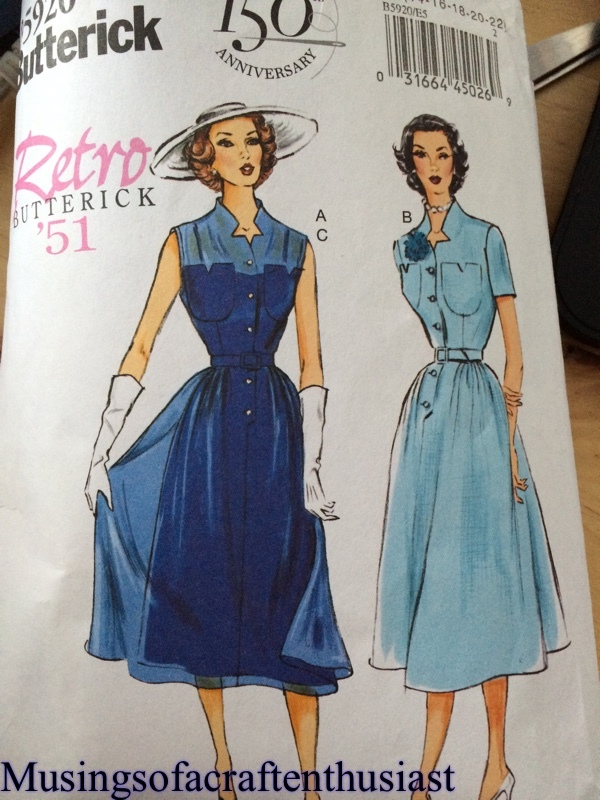 Technically the blue dress isn’t this pattern, the skirt is from a totally different pattern, the dress didn’t work in this fabric, it had a lightly gathered neck line which wouldn’t lie flat and sagged most awkwardly. 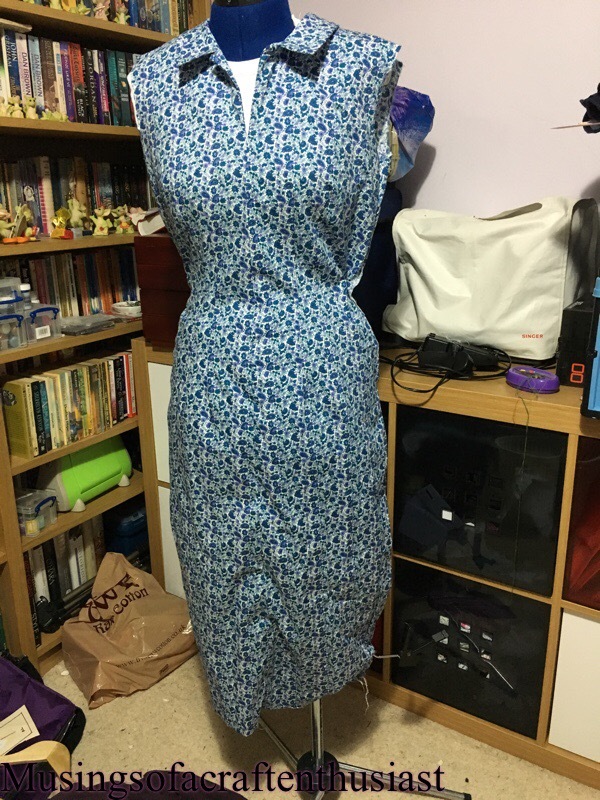 I gave it up as a bad job and looked around for something else to do with the fabric, as most of my other pattern at this time were kimono sleeves I didn’t have the fabric for it. 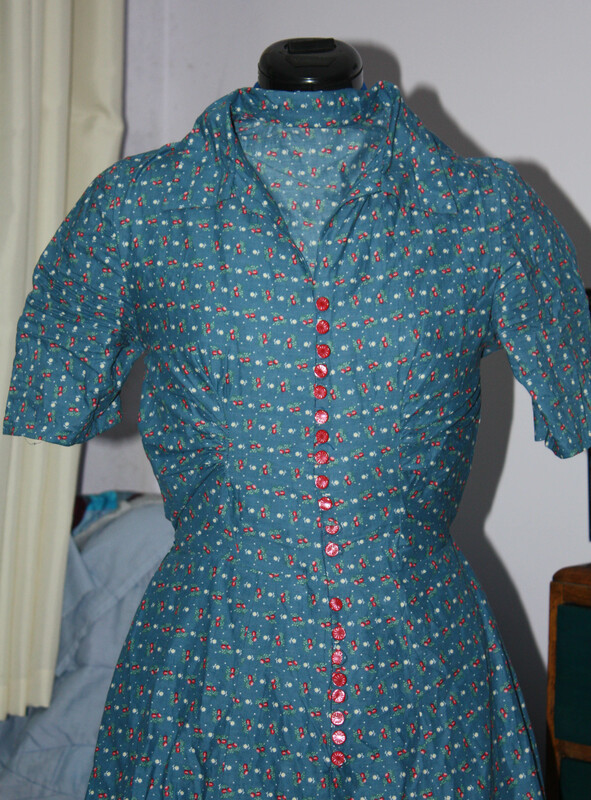 I think the end result looks good and I am pleased with the red buttons.